Frittatas are an easy way to use up random veggies you may have hanging out in the fridge. Since we get our veggie box on Tuesdays, yesterday, I needed to use up the last of the items I had leftover from the last box before today’s came. I was thinking about a frittata all night on Sunday! I had 2 plum tomatoes, about a cup of chopped chard, and some potatoes in the form of leftover hash browns. 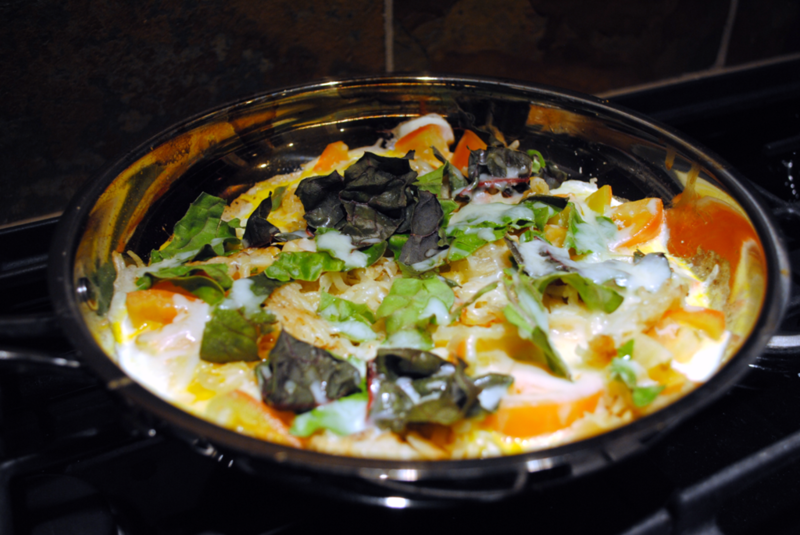 What seems like a motley crew of ingredients makes a fabulous frittata! 2 eggs and 2 egg whites. You can freeze the yolks if you want to use them later. It is good to add some starch like potatoes to help balance out the protein and fat from the eggs. Chop your veggies. Tomatoes, peppers, mushrooms and the like do not need to be pre-cooked. Potatoes do. (Chop them into a microwave safe bowl, add a small amount of water and microwave for 3 minutes and drain). This will vary based on what you put in it, but here are the facts for my tomato/potato/chard/mozzarella version. It’s bit high in the sodium and cholesterol department, so this is not an everyday breakfast, but it packs a lot of other nutritional goodness to even it out, and sure is good from time to time! If you’re watching sodium (as we all should be), leaving out the cheese will remove 80 calories and 170 mg sodium.